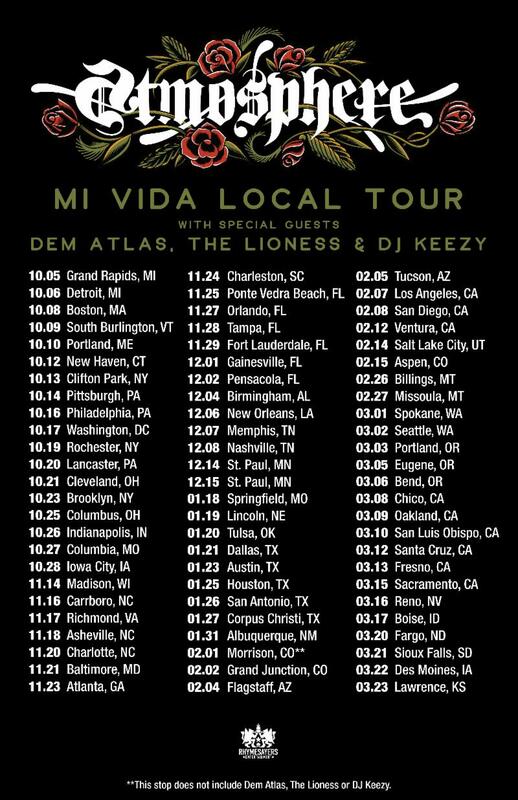 Iconic hip-hop duo Atmosphere are kicking off the new year back out on the road with a national headlining tour in support of their recently released album "Mi Vida Local" and will be in Los Angeles at The Novo on February 7, 2019. Known for their passionate and engaging live performances, Atmosphere’s self-described brand of Dad Rap promises for an unforgettable run. Atmosphere will also be joined on tour by friends deM atlaS, The Lioness and DJ Keezy. In support of the album release, Atmosphere has released the singles “Make It All Better Again," "Virgo," "Jerome" and "Graffiti." The world is a different place than it was two years ago, and the seventh Atmosphere album "Mi Vida Local" reflects the ways in which the world–and Atmosphere’s place in it–have changed. As the name implies, "Mi Vida Local" is intensely focused on the place it was created–the southside of Minneapolis–where Slug and Ant work tirelessly in their “beautiful basements,” refining their sound without interruption. A year of one-on-one collaboration resulting in an album that matches complex subject matter with equally deep beats–ones that show a clear lineage back to the psychedelic funk landmarks from an earlier era where America was going through a post-utopian hangover, and prove that there won’t ever be a time where boom-bap beats don’t sound perfectly of the moment. "Mi Vida Local" might be the best album Atmosphere’s ever made. It’s definitely the one they needed to make right now, and one listeners need to hear just as urgently. If it’s sometimes an album about how the fight to find happiness never really ends–even after you get the house and the kids and the artistic freedom to make dad-rap records–it’s also about discovering that there’s happiness to be found just in fighting. Joining Atmosphere on the run is innovative rapper/singer deM atlaS, also signed to Rhymesayers. deM released his "Bad Actress" album last fall, entirely produced by Ant of Atmosphere. deM has released several singles from the album, including "Gratitude" and a five-song visual EP "Bad Loves Company." Tickets for Atmosphere's tour available HERE.